To escape pirates, hostile neighbors or just the heat and humidity of the coast, South Americans often built their cities high in the mountains, isolated from the civilizations that developed in North America and Europe. Centuries later, these cities welcomed immigration and sought foreign investment and technology to bring them up to date. One of the major industries of the 19th century was the construction of railways to connect these cities with nearby ports. 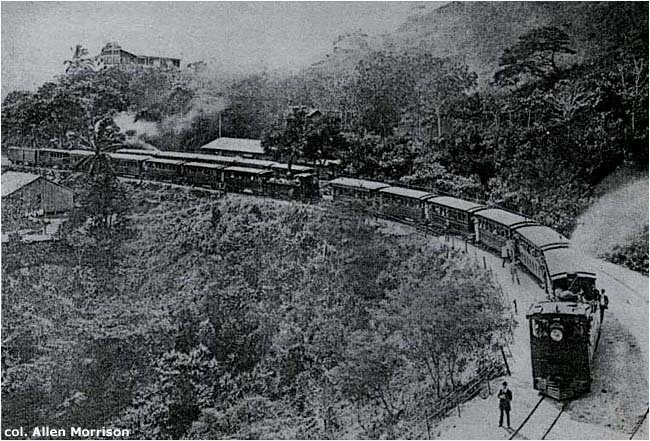 The British built a line in 1867 between Santos and São Paulo (alt. 2,600 ft) which used cables to move trains up and down the slope. 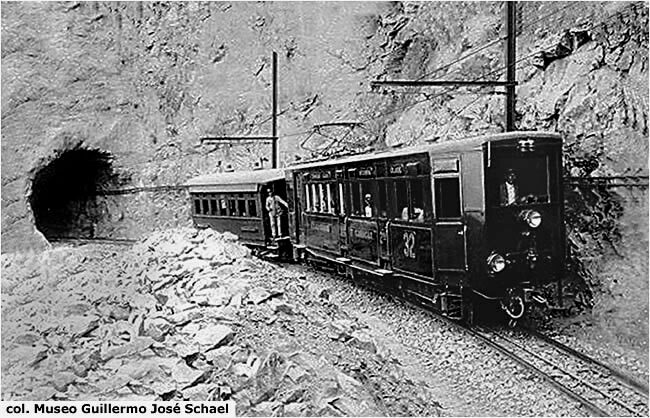 Rack-and-pinion railways opened between Rio de Janeiro and Petrópolis in 1883 and between Puerto Cabello and Valencia, Venezuela, in 1886. The railway from Guayaquil to Quito, Ecuador (alt. 9,350 ft), which used switchbacks, was not completed until 1908. La Paz, Bolivia (alt. 13,000 ft), did not have direct connection to a port until 1917. The Venezuelan capital, Caracas, is situated only seven miles from the Caribbean Sea, but lies at altitude 3,000 ft [see map]. 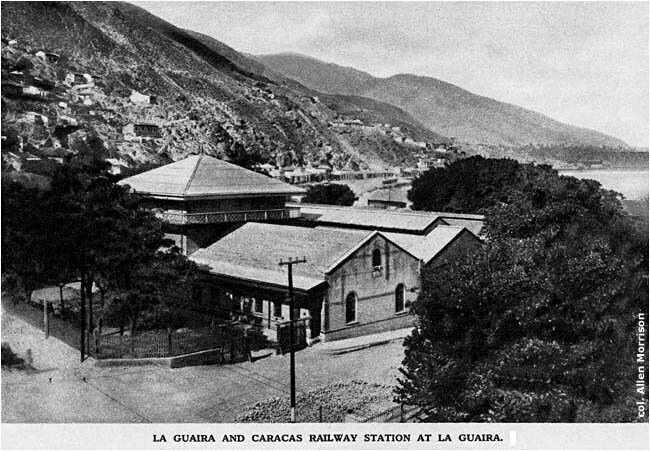 Surveys for a rail line from La Guaira began in 1867 and British and U.S. engineers disputed the route and financing for 14 years. 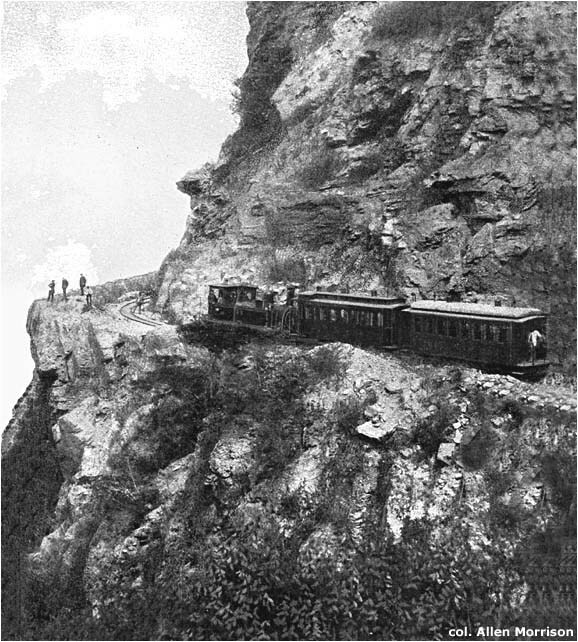 An English group finally secured a contract in 1881, registered La Guaira and Caracas Railway Company in London, and began construction of a 23-mile line that involved neither cables, switchbacks nor rack. 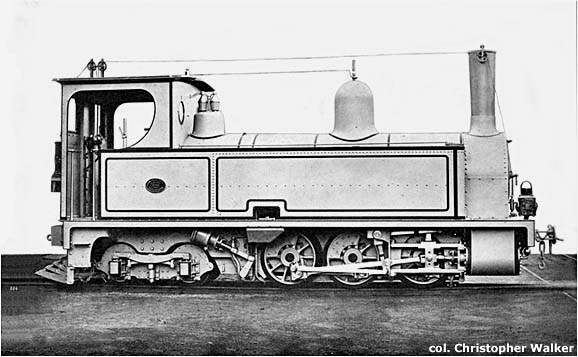 It ordered eight locomotives from Nasmyth, Wilson & Co. in Manchester and an assortment of passenger and freight cars. The line began carrying passengers in July 1883. Despite heroic efforts, good service and nice brochures, LG&C saw its passengers and freight move to automobiles, buses and trucks in the 1930s. 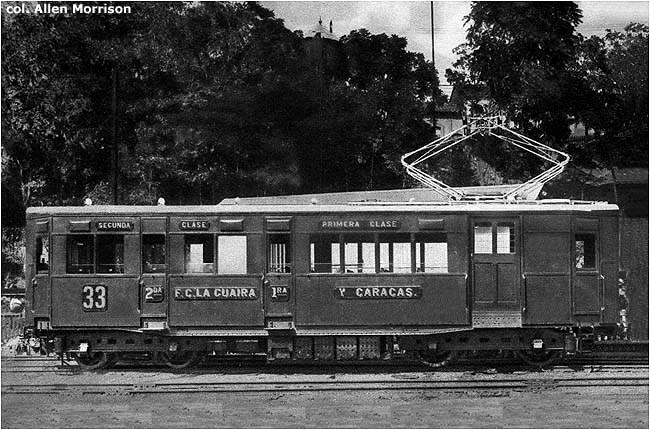 The line's 36-inch track gauge complicated interchange of both passengers and freight in Caracas, where all other railways (and the tramway system) used 42-inch gauge. LG&C was nationalized in the 1940s and purchased outright by the Venezuelan government in 1950. 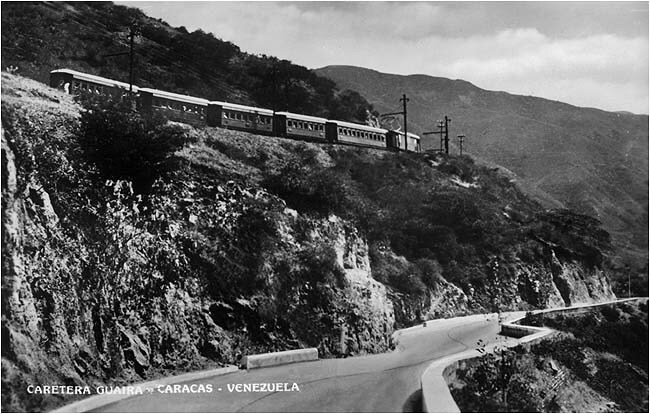 Storms damaged the line in 1951 and the government, preoccupied with the construction of a new highway between La Guaira and Caracas, did not make repairs. The railway never reopened. 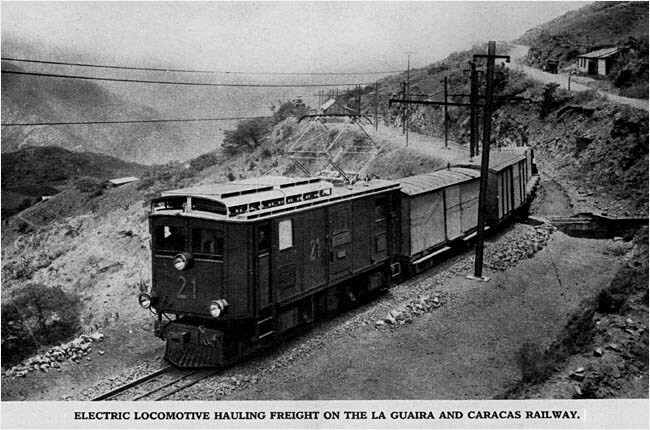 The La Guaira and Caracas Railway was one of three mountain lines in Latin America that were built or electrified in the 1920s. It climbed 3,000 feet in 23 miles and had grades up to 4%. 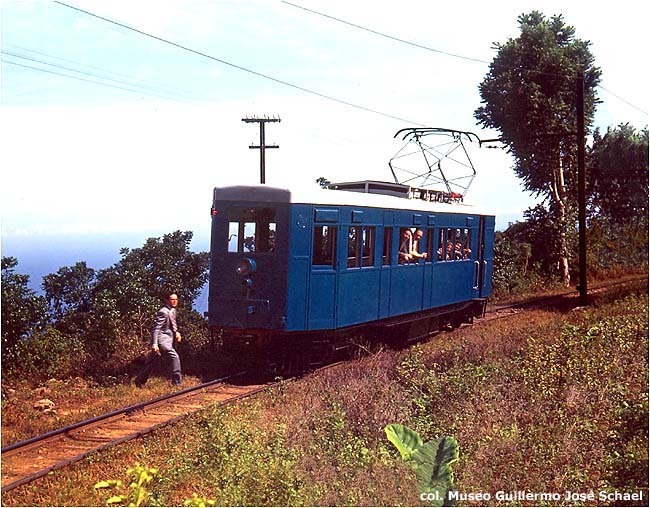 The meter gauge Estrada de Ferro Campos do Jordão in Brazil, which opened in 1924, climbed 3,860 feet in 29 miles and reached a grade of 10.5%. 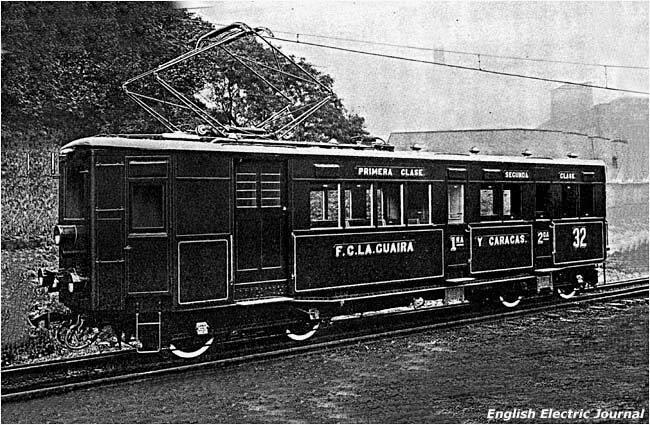 Like the LG&C, it was built by English engineers and used similar tram-like motor cars. 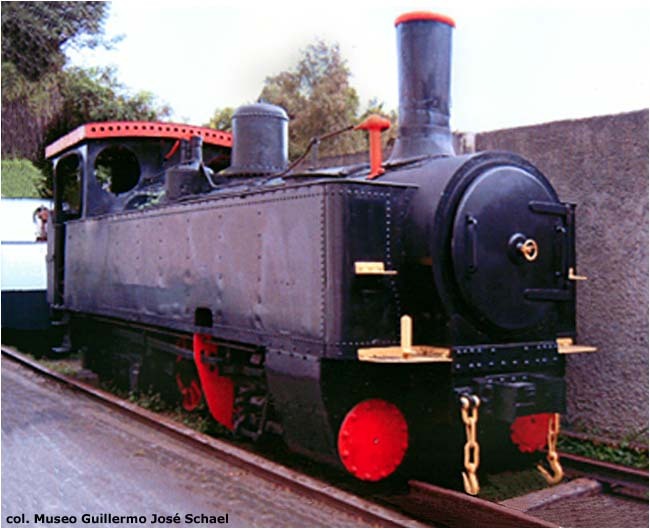 The 56 1/2 inch gauge Ferrocarril de Los Altos in Guatemala, built by AEG of Germany, began partial operation in 1928 and full service in 1930. Its length was 27 miles, similar to that of the LGC, but it had grades up to 9.25% and climbed 5,680 feet, almost twice as high. 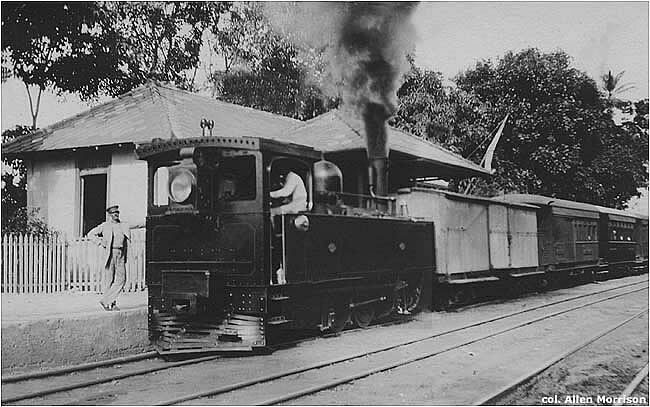 The Guatemalan railway ran for only three years. The Brazilian line still carries passengers today. Venezuela. Ministerio de Obras Públicas. 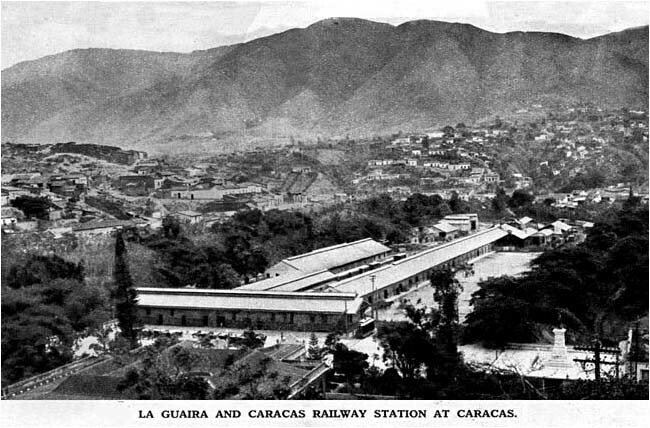 The Memorias and other MOP publications of the 1880s contain innumerable reports, often illustrated, about the construction and operation of the La Guaira & Caracas Railway. 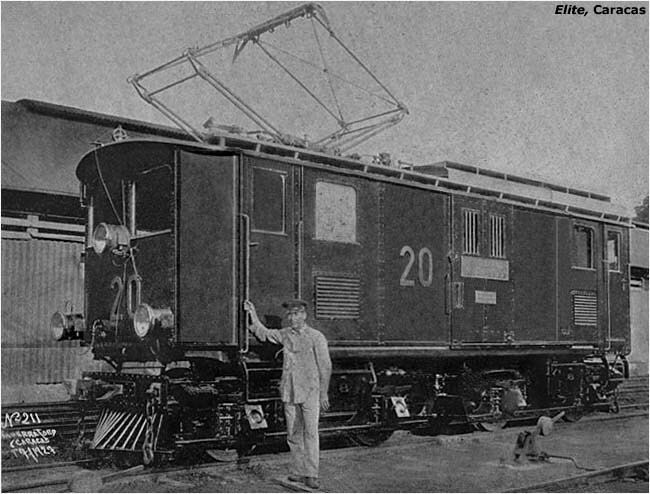 Untitled report on the electrification of the La Guaira and Caracas Railway in Railway Age (Bristol, CT), 29/10/1927, p. 870. 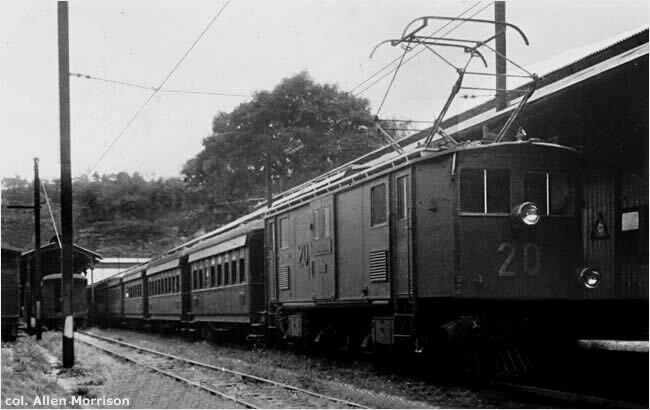 "Electrification of La Guaira & Caracas Rly." in English Electric Journal (London), 4/1928, pp. 74-77. Nice description of the project. Two photographs and two diagrams. Venezuela. Ministerio de Obras Públicas. Memoria de Obras Públicas. 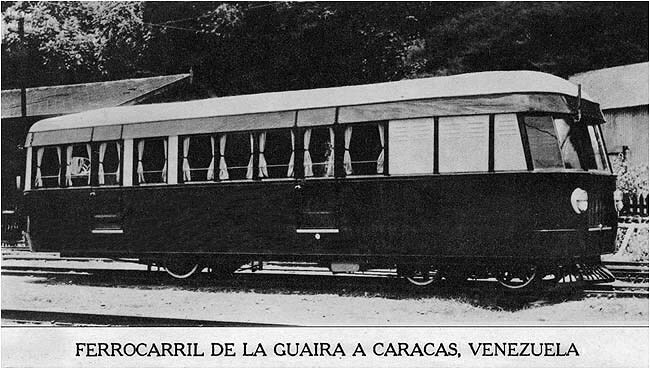 Articles and pictures of the Ferrocarril de La Guaira a Caracas in 1928, vol. 1, p. 235; 1929, vol. 1, p. 209; and 1929, vol. 2, p. 197. 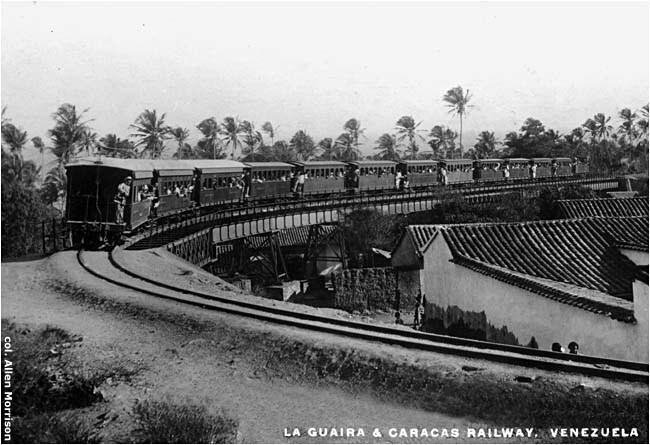 La Guaira and Caracas Railway. 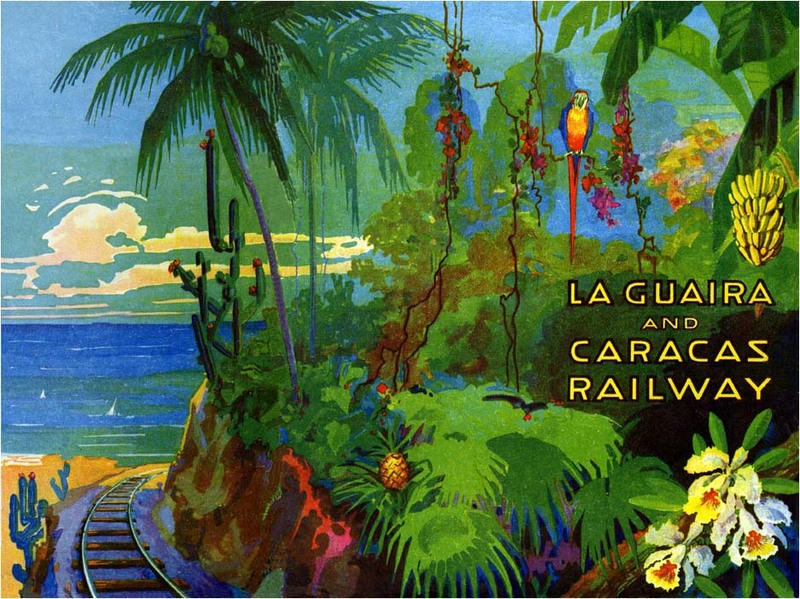 La Guaira and Caracas Railway. Undated travel brochures issued by the company and no doubt distributed on ocean liners. Nice pictures of tourist sites, maps, and views of LG&C equipment. Judging from advertisements and clothing, the two editions owned by the author seem to have been produced in 1932 and 1933. "Remarkable Venezuelan Mountain Line" in Modern Transport (London), 12/7/1942, p. 3. Good historical description of the railway in both its steam and electric eras. Map and four illustrations. Luis Cordero Velásquez. 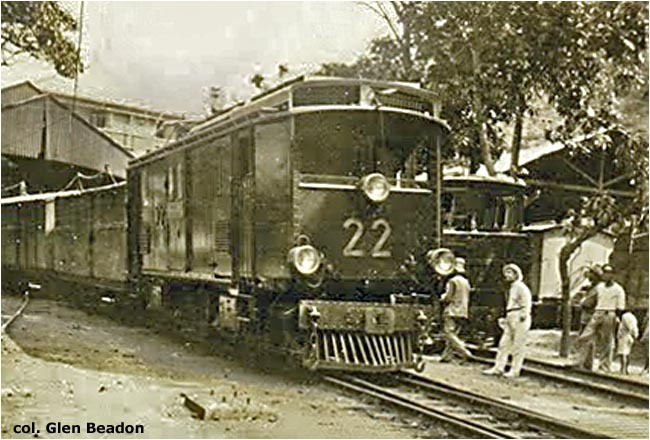 La Venezuela del Viejo Ferrocarril. Caracas, 1990. 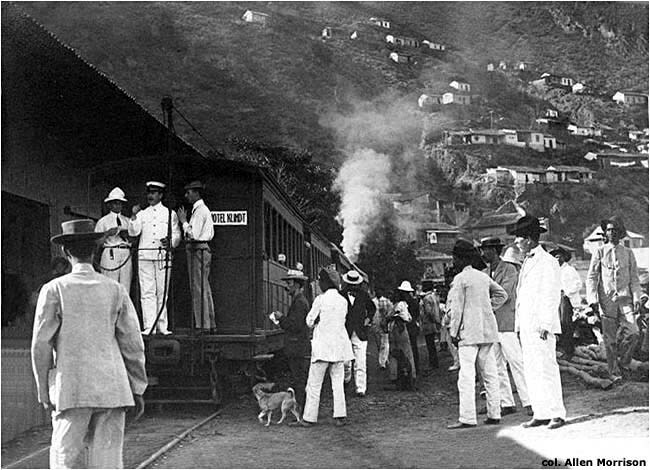 The development and construction of the Ferrocarril de La Guaira y Caracas, pp. 77-97. Rafael Arráiz Lucca. El ferrocarril en Venezuela: Una historia sobre rieles. Rafael Díaz Casanova, ed. Caracas: Consorcio Contuy Medio, 2006. Elegantly produced survey of Venezuelan railroads, including new lines under construction. Good maps. 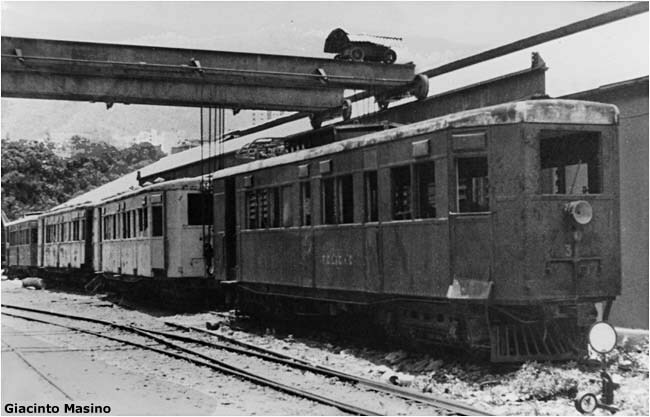 Construction of the La Guaira & Caracas line pp. 22-43. Alfredo Schael. Ferrocarriles en Venezuela: historia complicada. 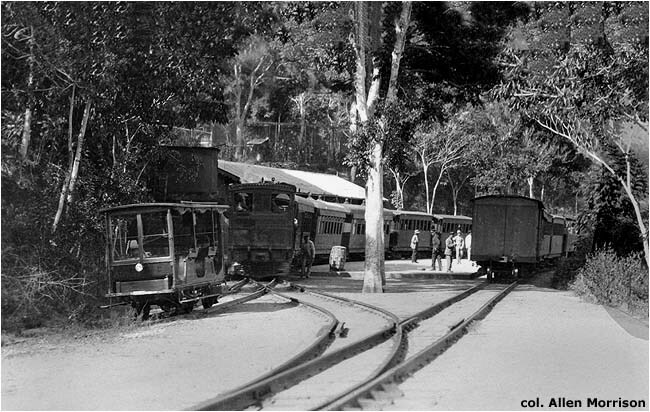 Caracas: Instituto Autónomo Ferrocarriles del Estado, 2006. 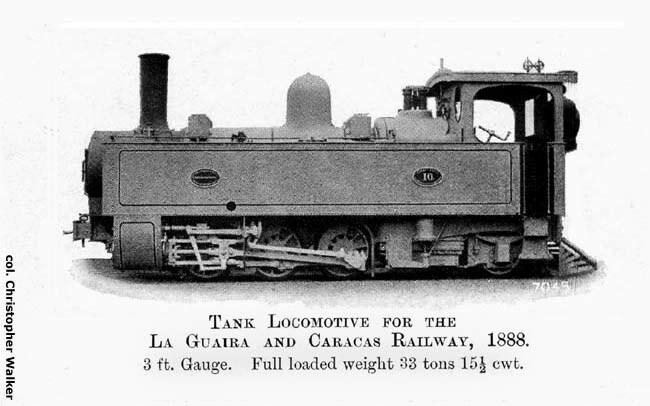 Illustrated history and description of the railroads of Venezuela. Extensive discussion of the La Guaira & Caracas line, especially on pp. 25-37 and 68-79. In addition to the photographers and authors noted above, I would like to express my gratitude to Alfredo Schael of Caracas, Christopher Walker of London and Giovanni Fullin of Venezia for their generous assistance in the preparation of this page.